50 years ago, in the midst of war, domestic crisis, and a Presidential election, the US lost within two months its two most dynamic and promising leaders, when first Martin Luther King Jr., and then Robert F. Kennedy, were cut down by assassins' bullets. RFK had emerged as the election favorite, building a coalition that cute across all lines of race, age, opinion and social and economic class. 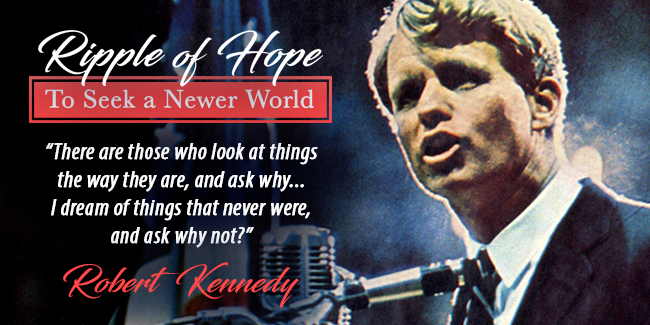 He proposed a dramatic project of American renewal, grounded on personal action, peace, love and the wisdom born from tragedy, in his 1968 Presidential campaign. Jefferson College is hosting Adam Walinsky, RFK's aide and speech writer, to discuss the legacies and relevance of Robert Kennedy and Martin Luther King Jr., and their shared visions for our nation. This year's Ripple of Hope event was held on April 11 and 12. It featured discussions with Adam Walinsky, but also breakout sessions, which allowed students and community members to ask questions. Discussion lead by Karen Aroesty, Regional Director of Mo./Southern Illinois, Eastern KS Anti Defamation League. This was a follow-up event for our common read of Life in a Jar: The Irena Sendler Project. Featured a panel of five local change makers who recognized a problem in their community and have taken action to create a solution. Feature a panel of five local leaders representing non-Christian faith traditions who shared recent experiences of the media’s representation of their faith and how their communities have responded to correct or clarify the public’s overall perceptions. The basis for the program will be the 45-minute independent historical documentary A Ripple of Hope that retells the events of April 4, 1968, the day that Dr. Martin Luther King Jr. was assassinated in Memphis and retraces the steps of Presidential candidate Robert Kennedy as he adsorbs the news of the killing and responds with courage, compassion and responsibility.